The building is a stunner, but it’s the free art and music that make the Chicago Cultural Center such a gem. Did you know Chicago is home to the largest Tiffany-stained glass dome in the world? Or that critically acclaimed art exhibits, performances, lectures and film screenings are available to you every day of the week for free all under one roof? This and more can be found at the historic Chicago Cultural Center. The Chicago Cultural Center is one of the city&apos;s 10 most popular attractions, and is considered one of the most comprehensive arts showcases in the United States. Taking up an entire city block, the venue presents more than 700 free programs a year, immersed in the humanities. Spend hours admiring the architectural splendor of this incredible gem, or just stop in for a quick dose of culture. Steeped in local history, the "People&apos;s Palace" is a downtown institution that stretches from Washington to Randolph Streets, and Michigan Avenue to Garland Court. It opened in 1897 to serve two purposes: As the first permanent home for the Chicago Public Library (the building&apos;s Washington Street side), and as the headquarters for the Grand Army of the Republic, the Civil War Union Army veterans&apos; organization (the building&apos;s Randolph Street side). 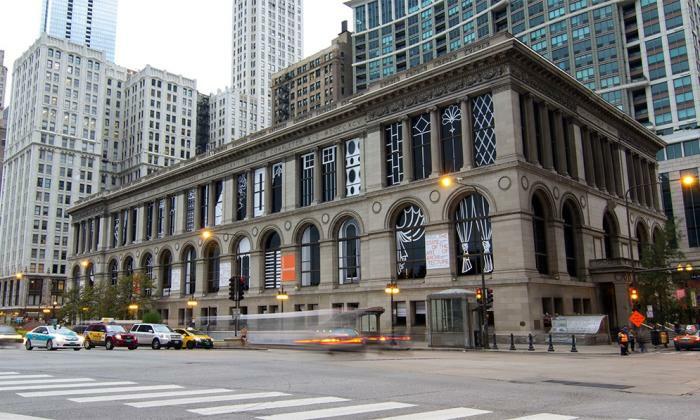 In 1947, the Chicago Public Library took over the entire building, later vacating it to open in its new central State Street location at Harold Washington Library Center in 1991. Also in 1991, the building was rededicated as the Chicago Cultural Center, and became the nation&apos;s first free municipal cultural center. 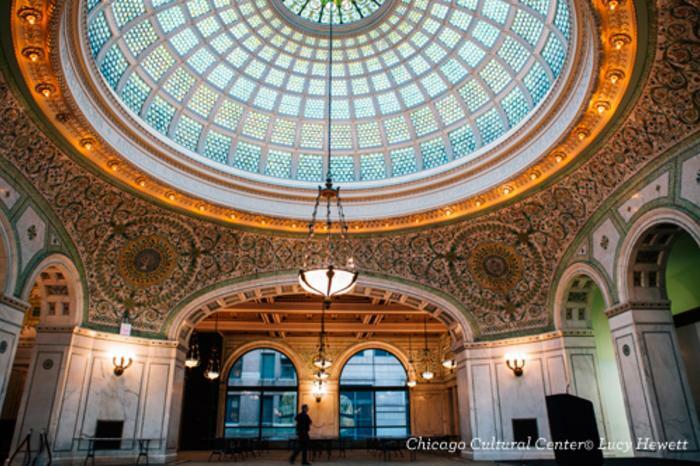 A Tiffany-stained glass dome, mother of pearl mosaics, a Carrara marble lobby — the Chicago Cultural Center&apos;s dazzling interior is the perfect backdrop for the artful programming hosted here. Washington Street Lobby – Originally the main library entrance, this glistening, light-filled space is one of the building&apos;s showcases. Mosaics of glass, gold leaf, mother of pearl and precious stones are set in the style of the Italian masters. The soft-surfaced marble is white Italian Carrara, the most expensive available, taken from the same quarries used by Michelangelo for his sculptures. Extending up three stories, criss-crossing staircases are richly decorated with themes relating to great thinkers, authors and literary works of the past. Preston Bradley Hall – Stairs open into the former book delivery room, a stunning hall that combines glass mosaics with a luminous 38-foot-diameter dome by the Tiffany Glass and Decorating Company of New York. Restored in 2008, it is the largest Tiffany dome in the world, containing approximately 30,000 individual glass pieces. Additional architectural features – Don&apos;t miss the 40-foot diameter dome and Civil War battle motifs in the Grand Army of the Republic (GAR) Rotunda and Hall; the massive windows and ornate ceilings in the Yates Gallery; and the central curving staircase on the Randolph Street side — gently inclined for the comfort of aging veterans ascending to the memorial rooms above. 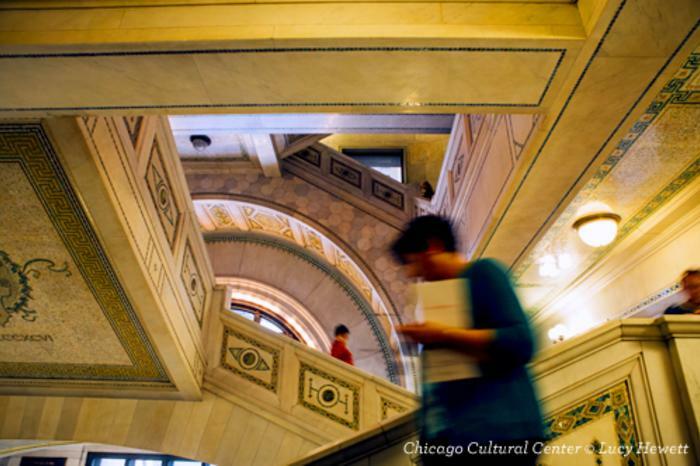 FREE 45-minute building tours of the Chicago Cultural Center are offered at 1:15pm from Wednesday through Saturday. They depart from the Randolph Street lobby on the first floor. Reservations are not required, but the 20 available slots book up fast. Come for the beauty, stay for the arts and culture — no tickets required. FREE Art Exhibits – Special and visiting art exhibits are featured year-round in four major galleries on the first, second and fourth floors. FREE Music Concerts – The ongoing music series takes place in jaw-dropping spaces, creating wonderful acoustic experiences. Lunchtime concerts take place on Tuesdays, Thursdays and Fridays, with classical performances taking place on Mondays, Wednesdays and Sundays. FREE Programming – Join downtown audiences for film screenings, lectures, theater and dance; or bring the whole family for kid-friendly events and workshops. 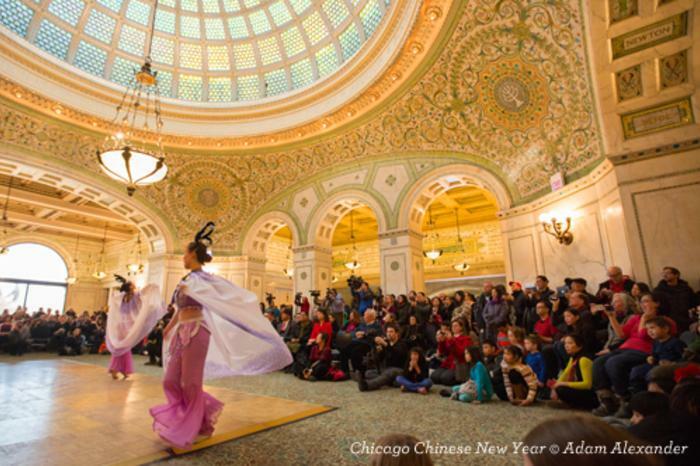 Check out the complete Chicago Cultural Center schedule. 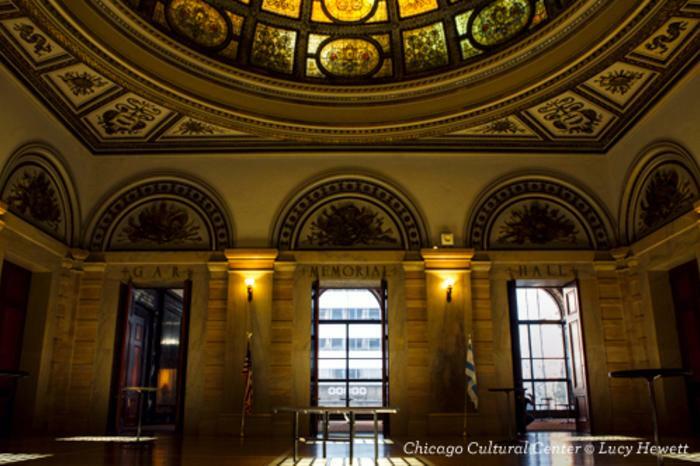 And take a look at 7 Free Things to Do at the Chicago Cultural Center.